The Magnolia Lounge was the first building of its kind in Texas inspiring a generation of architects to come and introducing European Modernism to our state. It was built by reknowned Swiss architect William Lescaze in 1936 for the World’s Fair. 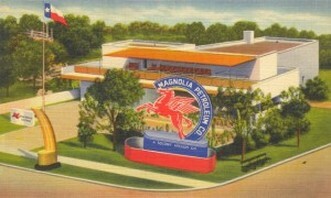 Magnolia Oil (think Pegasus the flying red horse) wanted a visitor’s center where people could watch films and enjoy continuous entertainment. People didn’t get the architecture at first. It was radically different, inspired by Da Da roots in Zurich and ideas garnered from the Paris Exposition of 1925 where the term “art deco” was coined. In 1947 the Magnolia Lounge took on a new life as the spot where theater director Margo Jones launched the American Regional Theatre movement. Margo Jones, nicknamed “The Texas Tornado,” wanted to bring her own brand of European modernism to Texas. She was greatly influenced by the European art theater of the 1930’s, and dreamed of a movement that would extend theater to all regions of America… a national network of nonprofit professional theaters that would serve new audiences and nurture new artists outside of Broadway and New York. Her first Broadway job was co-directing The Glass Menagerie, and the success of that play gave her the fuel she needed to conceive her dream. She would create “the theatre of tomorrow today” in Dallas TX. Theatre ’47 was born. Summer In Smoke and Inherit the Wind premiered there. Margo found and/or nurtured the work of Tennessee Williams, William Inge, Joseph Hayes, Jerome Lawrence and Robert E. Lee, and many others, and Theatre 47 became the first professional theatre-in-the-round influencing stage design in a variety of mediums even concert arena staging. But most of all, Margo’s dream came true, changing Theatre forever. Now, more than 450 regional theaters exist, and we no longer depend only on Broadway for new work making it possible for us to do what we do today, to produce and influence quality Theatre, right here in Dallas, TX. A few years after Jones’s death in 1955, the lounge went idle. During the 1980s and 1990s, the lounge functioned as a visitors center for Fair Park. Now, the building houses the offices of the Friends of Fair Park. Today, the theater space within is home to several small and progressive theater groups. It is now called the Margo Jones Theatre in honor of that woman who started it all. You’ll find the Magnolia Lounge at the intersection of Grand and First avenues, next to the African-American Museum.